Whether we want to be more conscious of our environmental impact, get ready more efficiently in the morning, reduce the amount of chemicals we put on our bodies, or simply wake up looking our best, we could all benefit from simplifying our beauty routines. According to The Campaign for Safe Cosmetics, the average American woman uses 12 personal care products a day, equaling an estimated 126 unique chemicals, many of which have been linked to certain cancers and reproductive problems. A few simple dietary changes don’t need to take any extra time out of your day, and after a while you may realize that you don’t need to rely on quite as many beauty routines anymore. Were you ever told as a kid that if you ate too many carrots you would turn orange? The truth is, the carotenes in brightly colored fruits and vegetables like carrots can increase the carotenoid content of your skin, giving it a pleasing yellow-orange glow. By including carotene rich foods like sweet potatoes, butternut squash, red peppers and cantaloupe in your diet, you’ll be able to maintain that sun-kissed look all year long. Many people use nail polish to cover up unsightly nails, or opt for false nails when natural nails are brittle and break easily. Instead, try drinking water and eating protein regularly, which will help keep nail beds hydrated and will produce strong nail plates. A diet that includes a variety of fruits and vegetables will provide the vitamins and minerals necessary to prevent ridges and spots. For extra nail (and hair) strengthening, consume biotin-rich foods like almonds, tomatoes, beans cauliflower, eggs, lentils, peanuts and salmon. While a fabulous night out may call for a bold lipstick, you can get away with a natural, healthy pink lip on a daily basis. Unfortunately, stress and adrenal exhaustion can drain the color from lips, leaving them pale. To help lips retain their natural color, eat a balanced diet that includes protein, non-starchy fruits and vegetables, essential fats, and don’t be afraid to add a little mineral salt to your meals. To boost the pink factor, consume carotene rich foods like carrots, sweet potatoes, butternut squash, red peppers, and cantaloupe. Many of us know about the foods that can stain your teeth like coffee, soft drinks, food coloring, red wine and dark teas, but there are actually some foods that can help whiten teeth. Crunchy, raw vegetables can whiten teeth due to their abrasive scrubbing when you chew. A 2013 study by the University of Grenada found that malic acid can increase saliva production, which helps protect tooth enamel and remove stains. 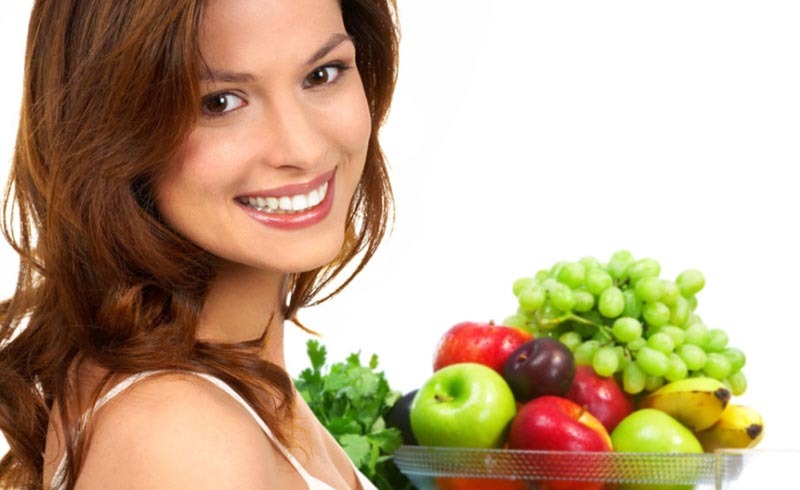 For whiter teeth, eat foods high in malic acid like apples, grapes, pears, and tomatoes. Once you’ve ruled out lack of sleep and nasal congestion as potential causes of dark circles, look to vitamins A, C, E and K to support healthy skin under the eye. Brightly colored fruits and vegetables like strawberries, broccoli, beets, and grapes can defend against free radical damage, while foods like legumes, nuts, seeds, and herbs can help maintain skin elasticity and strengthen capillary walls to prevent blood leakage. Sometimes, the cause of dark circles lies more in what you are eating rather than what you’re missing from your diet. Under-eye circles can be a sign of an underlying food sensitivity or sensitivity to a chemical in your home or workplace. If this is the case, seek out a professional that can test you for sensitivities or try an elimination diet.